The torch in the 2 ANS badge was placed there to indicate learning (or more specifically, enlightenment), while the arrow indicated true navigation. 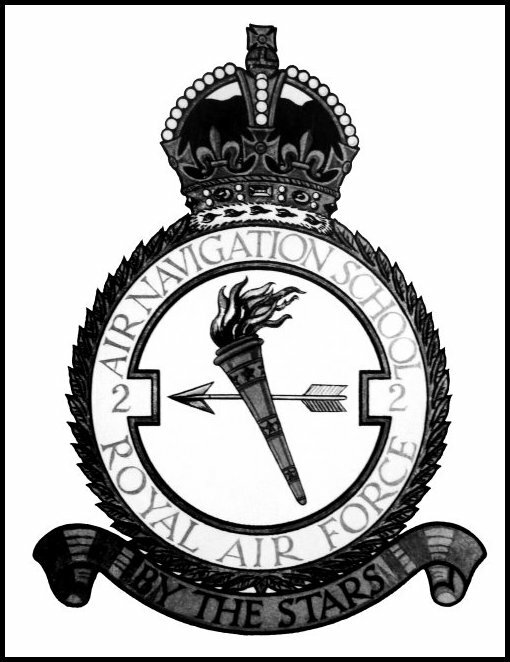 No.2 Air Navigation School (ANS) was formed at RAF Bishops Court on 4th June 1947, initially operating 21 Wellington T.Mk.X and 16 Anson Mk.1 aircraft. The unit moved to Middleton St George in January 1949, where the ancient Anson Mk.1s were replaced by the newer T.21 version. A further move, to RAF Thorney Island occurred on 15th May 1950, the School transferring concurrently from No.25 Group to No.21 Group. By this time the fleet had expanded to include Valetta and Varsity trainers, with the Wellingtons being withdrawn circa 1952 and the Ansons in March 1954. The Valetta was then used as a basic navigation trainer and the Varsity in the advanced role. Gp Capt SJ Marchbank, OBE, DFC was CO of No.2 ANS by 1954. The unit received its first Marathon aircraft (XA259, XA266 and XA268) on 5th March 1954 and eight of the type had been delivered by the end of June. However during March and April the aircraft dedicated their time purely to training missions for the staff pilots that would fly them. Nevertheless, on 30th April 1954, AOC No.21 Group, Air Vice Marshal GE Nicholetts, CB, AFC used one of the School’s aircraft when he departed for Malta on what must have been the first overseas trip for an RAF Marathon. When on 30th April 1954 the AOC 21 Group visited Luqa in Malta, he did so in one of No.2 ANS' Marathons. This photo shows XA272/H at Luqa with two stars on its nose and so likely shows this event. Note also the 2 ANS badge. 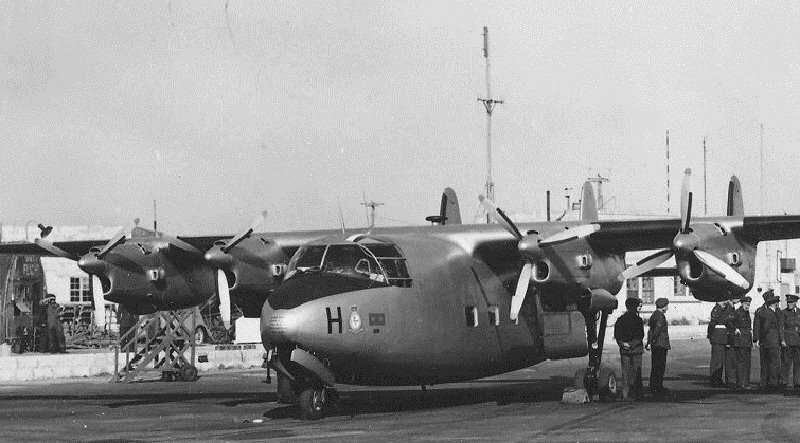 The arrival of the Marathon coincided with a mission change at No.2 ANS; previously the unit had undertaken "All Through" navigator training, but from May of 1954, the training of navigators to "brevet" standard was done at Winnipeg in Canada as part of the NATO Air Training Plan. The final “All Through” course (No.35) graduated from No.2 ANS on 2nd June 1954 and for a while, Thorney Island ran only Acclimatization Courses and Refresher Courses. The Acclimatization Course lasted 12 weeks and took the Canadian-trained navigators and familiarized them with the European weather and air traffic environment. In doing so it prepared them for their subsequent training at a type-specific Operational Conversion unit prior to going on to an operational squadron. A major part of the training took place in ground school, where there were classrooms set up to practice on the equipment before putting this training to use in the air. The ground classrooms were equipped with Gee, Rebecca and BABS equipment in dummy aircraft installations, giving instructors the opportunity to create realistic scenarios from a master control unit. The training consoles were a good way of avoiding expensive flying time and allowed a great deal of flexibility if weather conditions or aircraft unserviceability prevented ‘live’ training. Navigators on the Acclimatization Course would first take to the air in the School’s Valetta T.3 aircraft, a type which allowed for the training of ten students at a time. They would spend approximately 13 hours in these flying classrooms, learning Rebecca/BABS work, Gee fixing and homing as well as practical astronavigation. The Valetta was fitted with clear plexiglass domes in its roof to allow students to take star sightings. After initial airborne training on the Valetta they would move on to the Varsity T.1 and then spend most of their remaining flying time in this part of the course on the latter type. The work of the Varsity was supplemented by the Marathon T.11 and this stage of the Acclimatization Course was devoted mainly to daytime and night-time cross-country sorties, with the emphasis more on nocturnal work towards the end. From 1955, a final challenge at the end of this section was an hour of jet familiarization in a Vampire trainer. By now, the trainee navigator on the Acclimatization Course would have a sound knowledge of his trade and would be streamed to identify the RAF Command he would eventually go to. Students had a choice in stating their preferences, but the final decision depended very much on his abilities and of Service requirements. Once the decision had been made, the final four weeks of training on the Acclimatization Course was devoted to the Command Preparation phase. For candidates being posted to units within Coastal Command and Transport Command, they would stay on the Varsity. For those being sent to Bomber Command or Fighter Command, the pupils would be trained entirely on the Marathon T.11 (later, Vampire NF.10s were also used for training Bomber and Fighter Command navigators). Irrespective of their Command choice, all pupils now began to hone their skills, aiming for rapid fixings, high-level homings and the first interception exercises for the fighter navigators. By the end of the course they would have flown around 70 hours. Pictured at Thorney Island, this is the first Marathon to wear the code letter 'M' (XA252 being the second, later one). The second training commitment for No.2 ANS was the Refresher Course. 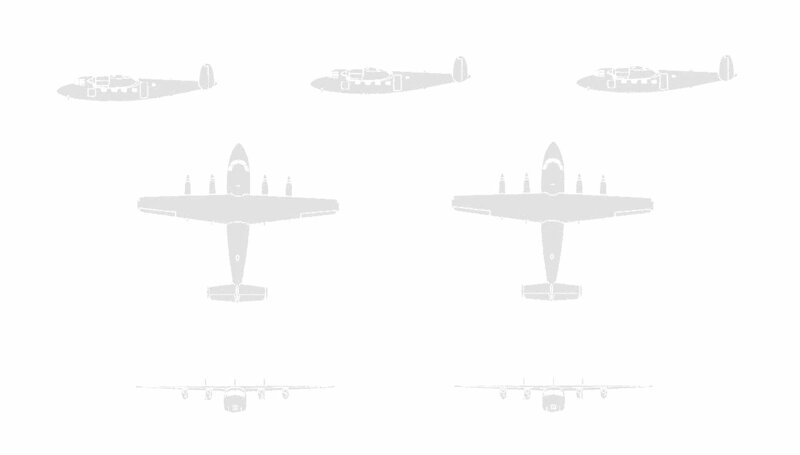 These were devoted entirely to fully-trained navigators who had been away from flying duties. The course enabled personnel to brush up their existing skills as well as familiarizing themselves with the latest navigation equipment and methods. As a result, each Refresher Course was tailored to its trainees and could vary in size from five to fifteen airmen, with an average class size of eight. These seasoned trainees varied in rank, from senior officers to NCO airmen. The Refresher Course lasted up to six weeks and comprised both ground training and a flight element. The latter totalled around 40 flying hours, in Valetta and Varsity aircraft. The Varsity and Valetta trainers began to be used in long-distance navigation exercises from the summer of 1954, the Marathon aircraft restricting their sorties at this stage purely to the UK. From 21st August, three Varsities and two Valettas took part in a four-day mission to Malta, carrying 23 Cranwell Cadets. The School's aircraft also began to be used to simulate 'enemy' bomber forces in Fighter Command exercises, beginning with Exercise 'Bounce' over the weekend of 28th and 29th August, followed by 'Morning Mist' which ran from 23rd September to 2nd October. The latter was in fact a NATO sea/air exercise and it seems that only the Varsities of 2 ANS were utilised, acting as attacking forces alongside Canberras and Lincolns of Bomber Command. Amid this warlike activity, on 15th September Thorney Island held its Battle of Britain 'At Home' Day. Approximately 9,500 spectators descended upon the Station, in spite of less-than-favourable weather. A full flying programme was laid on and amongst the distinguished guests were the Lord Mayor and Lady Mayoress of Portsmouth, the Dean of Chichester and Air Chief Marshal Sir Arthur Barrett, RAF (retd). The event raised £340 for RAF charities. It was on 30th September 1954 that Marathon XA271 crashed - the reason for the creation of this website. The incident is described here. At the end of January 1955, No.21 Group was disbanded and Thorney Island then transferred back to No.25 Group, though for No.2 ANS it was business as usual. Additional training was also taken on at this time, including a Second Tour Navigator's Course, which commenced on 19th January. Prior to this, at the end of the previous November, the Air Signallers Course had transferred to 2 ANS from No.11 Flying Training School. For the Marathons, the end of 1954 and the early months of 1955 saw Valetta and Varsity aircraft performing a number of missions to support the low availability of the Handley Page trainers. In January 1955 alone, there were five sorties by Varsity and 22 by the Valettas to bolster those that had been programmed for Marathons. There seems to be no record to account for this shortfall, but it seems likely that extended maintenance timescales, shortage of spares and structural issues (all common Marathon complaints) would have been likely culprits. One non-Marathon story regarding No.2 ANS deserves mentioning here. On the night of 25th April 1955, 20 year-old LAC Nanik 'Nick' Agnani, one of the unit's airframe mechanics, decided to steal a Varsity, and to a certain extent he achieved his aim. The reasons for his rather strange objective are not known, but it is thought that he had previously been turned down for pilot training because of colour-blindness and resented the fact. Agnani had previously taken a few flying lessons and so he knew the basics of flying and at the chosen moment on a night shift he boarded WF426, started the engines, taxied to the runway and took off in a rather shaky fashion, crossing low over the sea wall and flying off to who knows what. Now alerted to this bizarre situation, Thorney Island scrambled a second Varsity to follow Agnani's aircraft and report on its progress. Over the next few hours, he circled the London area, before heading south, crossing the Channel and continuing his journey into French airspace. Sadly his escapade ended in tragedy when the aircraft crashed into a farmhouse near Valenciennes, killing Agnani and three on the ground. During this period, the Marathon and Valetta aircraft had a rather low-key existence at Thorney Island, with the Varsity often being used on a number of RAF exercises and for long-range training missions overseas. The unit records for this period are also rather bland and so the assumption is that the Marathons - now able to achieve their flying commitment without resort to other types - continued training without fanfare. It is also worth noting that there are few recorded incidents on the aircraft's individual record cards and this is in stark contrast to the incident-heavy life led by these same aircraft when they later operated from Topcliffe with No.1 ANS. From 20th June 1955, with the impending arrival of Vampire night fighters at 2 ANS, separate Squadrons were set up within the School to cope with operating four different aircraft types. Sqn Ldr AF Carlisle, DFC assumed command of No.1 Squadron (Marathon and Vampire), while Sqn Ldr LAE Osbon, DFC took over No.2 Squadron, responsible for Varsity and Valetta operations. The first Vampires arrived during the same month and were equipped with the Gee Mk.3 and Rebecca Mk.4. The arrival of these jet trainers made No.2 ANS the only regular RAF unit to operate single-engined jet and four-engined piston aircraft concurrently. Some idea of the intensity of training at this time can be gauged from looking at the courses which were underway in June of 1955. On the first of the month, No.6 Refresher Course commenced training, followed a week later by No.19 Class H Signallers Course and ten days after that, No.58 Acclimatrization Course and No.7 Refresher Courses also began. No.20, 21 and 22 Signallers Courses also started their tuition prior to the end of June as well as No.8 Refresher Course. In the same period, eleven similar courses of students passed out. During the summer of 1955 the Marathons finally ventured further from base, with one of the first overseas sorties commencing on 2nd August as part of a navigation training exercise to Wunstorf in Germany for 40 Cranwell Cadets. This proved to be a large-scale detachment, involving four Varsity, two Valetta and a pair of Marathon aircraft, plus six officers and NCOs from No.2 ANS. An Advance Party, aboard a Varsity trainer left Thorney Island on 2nd August, with the main force following the next day. The main party departed for Wunstorf at midday, arriving in Germany at 1pm local with the Marathons flown by Flt Lt Owen and Sgt Davidson. These aircraft each carried a crew comprising of Signaller, Screen Navigator and a First Navigator, with FS Gregory, Fg Off Howard and Sqn Ldr Moffatt, respectively filling these roles on Flt Lt Owen's aircraft and Sgt Sandford, Flt Lt Thrasher and P Off Peake abord the Marathon of Sgt Davidson. After lunch and a quick turn-round at Wunstorf, the whole formation departed at 6pm and arrived back at base at around 9pm the same evening. A similar exercise was flown on 17th August, but this time with Fg Off Wood (carrying three Cadets) and Sgt Glading (two Cadets) flying the Marathons. But it is noteworthy that the Varsities at this time usually travelled further afield and had flown at least one navigational sortie to Idris in Egypt as part of each “All Through” course. The annual Battle of Britain 'at home' days was held on 17th September 1955 and this time raised £330 for RAF charities from its estimated 10,000 attendees. With better weather this year, the flying display proved popular, a feature being flypasts by Varsity and Marathon aircraft of 2 ANS. The Varsity flypasts included mock interceptions by fighter aircraft from Tangmere while the 3-aircraft Marathon formation (piloted by Flt Lt Owen, Fg Off Wood and FS Dunkling) routed from an initial flypast at 1.45 pm and then to Hullavington, Little Rissington, Shawbury and back to Thorney Island for a second flyby at 4.10 pm. The three machines then flew on to Tangmere for another flypast before returning to base. Aside from the formations at Thorney Island, No.2 ANS also provided a Marathon for a flypast and static display at Aberdeen's Dyce airport, as well as a further static example at Hullavington's display. 1956 began literally with a bang. During a night mission on 9th January, XA254 was brought in to land on south-facing Runway 01 but the pilot misjudged the landing lights and set his Marathon down midway along the runway. In itself this should have presented no major issues, except that the runway was icy and instead of braking to a stop, the aircraft skidded across the threshold and over the sea wall, taking the BABS vehicle with it. The latter had been correctly parked on the runway centreline at its southern end. The aircraft came to rest on the high tide mark, and the crew managed to escape through the wrecked cabin. It is not known if the BABS vehicle was occupied at the time of the accident, but no injuries were reported. It is fair to say that the Marathon was a somewhat fragile aircraft (and this had in fact been a contributory factor in the loss of not only the first prototype, but also of XA271 in September 1954), and by the spring of 1956 it had begun to be felt when many aircraft began to show evidence of wing skin wrinkling and pulled rivets. In response to RAF Defect Reports from 2 ANS, Handley Page had initiated two trial installations of Modification No.1046 (Improve centre section leading edge skin covering and local rib attachments between inboard and outboard engines) and 1076 (To strengthen skin across surface of centre section between drag ribs). With this trial work complete, the Ministry of Supply organized a meeting at Thorney Island on 12th April 1956 to discuss progress and to determine how best to proceed. Handley Page representatives were as yet unable to fully comment on the success of the trial modifications but did state for the record that the initial defects had not been of a structurally serious nature. In the interim they suggested that bushing of the outer wing attachment brackets would be advisable to ensure continued service of the aircraft, with RAE studies showing that in the navigational training role, a service life of 2400 hours was the point at which bush repair would need to be initiated. Meanwhile, two of the unit's Marathon aircraft (XA256 and XA268) had been placed Cat.3 for skin wrinkling and the meeting was able to give a go-ahead for repairs to commence. Handley Page also agreed to complete a survey of all Marathon mainplanes in service with a view to defining acceptable limits for skin wrinkling and loose rivets. By the end of 1956, four of Thorney Island's Marathons (XA250, XA256, XA268 and XA270) had been repaired, with XA266 and XA272 awaiting completion of work. A further three aircraft in storage at 10 MU (XA260, XA262 and XA264) were also found to have skin wrinkling and pulled rivets which were beyond safe limits and would also require repair. Of note, the April 1956 meeting included an Appendix showing the usage of the ten aircraft in the 2 ANS fleet (which had flown up to two years in RAF service by this time) and it makes for interesting reading. The airframe hours on each aircraft were as follows: XA250 (582 hours), XA253 (328 hours), XA255 (444 hours), XA256 (838 hours), XA259 (627 hours), XA266 (275 hours), XA268 (725 hours), XA270 (695 hours), XA272 (645 hours) and XA273 (489 hours). Further changes to training had begun back in January with a meeting at Thorney Island to discuss the introduction of a basic navigation course for pupils destined to become sergeant Radio Observers in Fighter Command. Those present at the conference included Mr RW Jackson, Chief Engineer from HQ Flying Training Command, Wg Cdr AF Wallace, Chief Navigator Officer at HQ FTC, Sqn Ldr AH Fernand, Nav.1 at HQ FTC, Sqn Ldr BV Kerwin, Org.3 at HQ FTC and Sqn Ldr FW Slaughter, G.Nav at HQ No.25 Group. Following this meeting it was decided to assign this training to 2 ANS and the first course (No.1 RO Course) was programmed to start on 5th September but was delayed for three weeks, with an intake of 12 pupils and for a duration of 20 weeks. The commencement of these 'ab initio' courses meant that 2 ANS once again had an "all through” training element. Pupils came from two different streams - a minority via remustering of existing Service personnel, but mainly straight from initial training ("square bashing") at RAF Hednesford. The role of Thorney Island was to take these raw recruits and bring them to the point at which they could go on to the AI School and then to an OCU. The 20-week course involved more than 500 hours of ground school and in excess of 150 hours in the air. The ground school taught such diverse subjects as aviation medicine, general duties, meteorology, physics, instruments, compasses, radio and airmanship. The existing training rooms were used for this aspect, and now that there was a resident Search and Rescue squadron at Thorney Island, the latest rescue methods and equipment could also be taught. The Radio Observer Course then used all four aircraft types in service with No.2 ANS (Marathon, Vampire, Valetta and Varsity) to practice elementary navigation as well as an amount of familiarization flying due to the low experience levels of most of the students. The flight element began at the start of the fourth week of the course, with students initially doing familiarization flights in the Valetta and elementary map reading in the Varsity. They would then progress to Rebecca/BABS training and two weeks later move on to Gee. The airman would then bring all of these together with other basic navigation skills. In week 9, there would be an hour of familiarization flying on the Vampire, but no navigational work on the type until right at the end of the course. At about the mid point, the pupil RO would be doing a lot of cross-country preparation and during week 11 would fly the first actual practice sortie, being directly responsible for navigating the aircraft. Towards the end of the course, more emphasis was placed on proficiency on the Mk.III Gee and then more difficult tasks could be introduced. This was where the course began to really focus on the ultimate objective of training for Fighter Command and much of this phase (including night and high-speed cross-country sorties, low-level map-reading and GCI) was done on the Vampire. No.2 RO Course started on 24th October, and thereafter there would be one course starting every month. Also during 1956, Cranwell pilot and navigator cadets began to receive training in basic navigation at Thorney Island, including 60 hours of flight training during their first year. The airborne training was completed in both Marathon and Valetta aircraft. There are few sorties recorded specifically for the Marathons during this period, though on 30th October, two of the type flew to Jersey to pick up members of the Combined Cadet Force from Victoria College on the island. From 6th November 1956, No.75 Acclimatization Course began, and was notable for the inclusion of its first Burmese cadets, Flt Lt Maung Maung Myint and Fg Off Tin Latt. "This unit will revert to All-Through Navigation Training of navigators early in April 1957. In order to provide the necessary facilities for this, Refresher Training, Radio Observer Training and Pilot Refresher Training are being transferred to No.1 ANS Royal Air Force Topcliffe." XA266 wore the 2 ANS badge on its nose, along with its individual code letter 'J'. (Bert Chivers via Peter Amos). March was the last productive month for the Marathons of No.2 ANS. They flew a total of 104.40 training hours and 57.15 non-functional flying hours. The unit had flown more than 8770 hours on the Marathon in approximately three years of operations and lost just two aircraft. This is in stark contrast to the experiences of No.1 ANS, about to embark on operations with the type. Most of the 2 ANS Marathons were ferried out to Topcliffe during March of 1957.